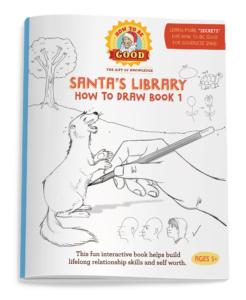 How To Be Good – How To Draw Book 1 shares “secrets of how to draw.” It comes in a Santa or Polly the Parrot version. We have multiple illustrating styles and use various techniques to help children develop their own style. We teach how to draw girls, boys, all types of animals, scenery such as trees or benches and buildings, and more. Our goal is to continue to help build skills so children can have fun playing while learning. We are not looking for perfect drawings, we have professionals that will help fine tune any submissions. Click here for Contest Details. In addition, everyone can be a winner by having their character made into a Budsies custom plush animal or doll for a very reasonable fee! Everyone can also be a winner by having a stories of their character(s), or funny real life situations, turned into your personal custom comic by The Peanut Gallery for a very reasonable fee! This fun interactive How To Draw book is a stand-alone product, or it can work seamlessly with the How To Be Good goal planning worksheets, weekly worksheets, monthly behavior tracking chart, gold star reward stickers, other activity books, picture books, and other products.